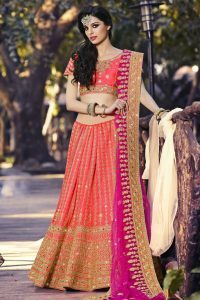 Peach Net Georgette Party Wear Lehenga Suit is beautifully weaved together with resham zari thread intricate modern ethnic embroidery with sequins, stone and cut work all over and is paired with an embroidered choli. 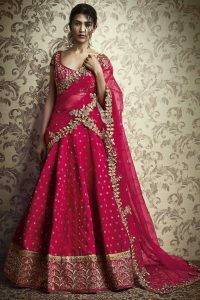 The outfit comes with a santoon inner and an embroidered net chiffon dupatta. The suit top will be in Semi-stitched material with unstitched bottom. This can be stitched using the tailoring options select “Custom stitching” option with a step by step guide. If there are any design changes to be made you will be emailed from our stitching team stitching@omsara.co.uk subject to design limitations. This can be customised to fit sizes 32,34,36,38,40,42 (Slight variation in colour, fabric & embroidery work is possible. Model images are only representative.) Model accessories and latkans are not included.